"The Punisher" #28 (vol 2) pg 6 from 1989. If you've never even imagined. 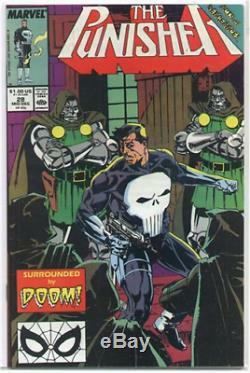 Frank Castle taking on DOCTOR DOOM, then think again. This beautiful 3 quarter splash, The Punisher confronts the Lord Of Latveria. For "THE FIRST TIME EVER". And from the dialogue, Frank seems as baffled as the. This piece of ORIGINAL COMIC ART was from a storyline, at that time. It had various Marvel superheroes taking on. Super-villains they weren't accustomed to ever facing off with. Some pretty unusual stories, such as this one. The art was created by Bill Reinhold. The art comes from a smoke-free home, and is in excellent. This art shall be sent out FLAT, STURDY, & SECURE. Lucky winner of this fantastic ONE-OF-A-KIND masterpiece agrees to pay S&H. Good luck on winning this KEY page, featuring The Punisher facing off with. Doctor Doom for the very first time. And hopefully, not his last.. 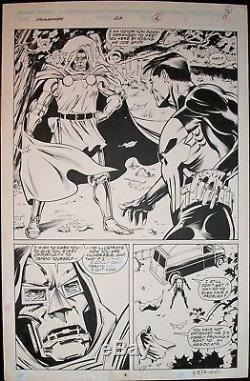 The item "THE PUNISHER #28 VS DR. DOOM ORIGINAL ART 1989 ACTS OF VENGEANCE / BILL REINHOLD" is in sale since Friday, April 13, 2018. This item is in the category "Collectibles\Comics\Original Comic Art\Other Original Comic Art". The seller is "rockin_art" and is located in Henderson, Nevada. This item can be shipped to United States, Canada, United Kingdom, Denmark, Romania, Slovakia, Bulgaria, Czech republic, Finland, Hungary, Latvia, Lithuania, Malta, Estonia, Australia, Greece, Portugal, Cyprus, Slovenia, Japan, China, Sweden, South Korea, Indonesia, Taiwan, South africa, Thailand, Belgium, France, Hong Kong, Ireland, Netherlands, Poland, Spain, Italy, Germany, Austria, Israel, Mexico, New Zealand, Singapore, Switzerland, Norway, Saudi arabia, United arab emirates, Qatar, Kuwait, Bahrain, Croatia, Malaysia, Brazil, Chile, Colombia, Costa rica, Dominican republic, Panama, Trinidad and tobago, Guatemala, El salvador, Honduras, Jamaica.